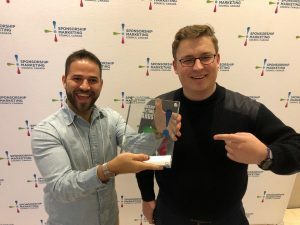 Two of our team, with the GOLD win at the 2019 SMAs for Best New Innovation. We’re excited to announce that Hockey Canada’s BriziCam-powered sponsor activation for the World Junior Ice Hockey Championships in Vancouver, has won gold for Best New Innovation at the 2019 Sponsorship Marketing Awards (SMCC- Sponsorship Marketing Council Canada). The sponsoring partners include: Pepsi, TELUS, ESSO, Canadian Tire, and Tim Hortons. Brizi lets anyone tap into nearby cameras to capture group memories at iconic places. Watch the video, see how it works.